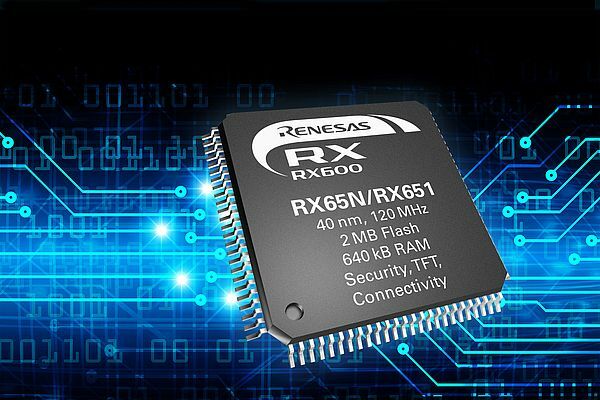 Renesas has expanded its RX65N/RX651 series. The new microcontrollers meet all the security requirements of endpoint devices in industrial automation, building automation, and smart metering systems. Furthermore, they enable simple firmware updates and cost-effective HMI solutions. The new members of the RX65N/RX651 series boast a Trusted Secure IP to ensure a high level of security. Through the integration of encryption hardware accelerators – such as AES, 3DES, SHA, and TRNG – and secure access, the encryption key is protected by the Trusted Secure IP. Moreover, the boot code is protected by a secure Flash area. Protect and dual-bank functions prevent erroneous writing on the integrated Flash memory while enabling secure program updates via the network. The RXv2 core with a 4.55 CoreMark at 120MHz, or 4.35 at 240MHz, and the 40nm process ensure efficient CPU operation. The microcontrollers therefore guarantee confidentiality, integrity, and availability and make cyber-attacks less likely. Firmware updates as required for industrial applications are significantly easier and more secure with the new RX65N/RX651 microcontrollers. The dual-bank Flash memory supports both BGO (Back Ground Operation) for self-programming of the firmware update and the SWAP function. It is thus possible to change the selected code Flash area at the start of a reset. End devices in IoT are increasingly equipped with a small TFT display to enhance system monitoring and control. WQVGA color TFT displays can be used with the new RX65N/RX651 without external RAM thanks to 640 KB of on-chip RAM. The embedded TFT controller and the integrated 2D graphic accelerator provide advanced performance and greater user friendliness. The GUI tools from the Renesas ecosystem ensure short development times. The Renesas Envision Kit provides an evaluation environment that allows design engineers to benchmark MCU performance in their application and to start developing their own software. Renesas has also developed a new starter kit for the new microcontrollers. It includes a development board with MCU, display, on-chip debugger, trial Renesas C compiler, and Integrated Development Environment (IDE).